three chapters of the book. 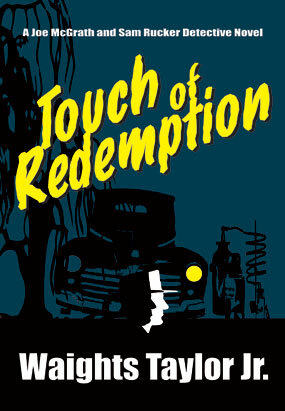 "To rightfully observe that Touch of Redemption, the second novel in Waights Taylor’s Joe McGrath and Sam Rucker Detective series, is a page-turner—from first to last—fails to fully describe its considerable merits. Firmly grounded in the atmosphere of racially-charged late 1940’s Southern noir, Taylor has created a universe of vivid characters, no doubt modeled on the many colorful individuals whom he clearly was familiar with growing up in Alabama. Following his cracking of a sensational murder case in Kiss of Salvation, the series’ first novel, Joe McGrath has left the Birmingham police department to start a private detective agency in secret partnership with 'the only colored private investigator in Birmingham,' Sam Rucker. Throughout the plot’s initial misdirection, Taylor firmly establishes the relationship between Joe and Sam—a solid bond that will protect them in returning to Joe’s roots attempting to solve the mystery of his father’s murder years before. As if straight out of an episode of HBO’s rural-gothic True Detective series, Joe and Sam encounter an intricate maze of small town graft, lakeside racist rituals, shape-shifting politicians and businessmen, and the occasional eccentric hero. Taylor spins a yarn that is simultaneously fantastic and yet entirely plausible. But after all, isn’t that contradiction—among so many others—what the rest of us find eternally fascinating about the American South?" "Waights Taylor Jr. delivers a mystery that advances his detective series so that we better understand the time prior to the Civil Rights era even better. Touch of Redemption teaches us that black lives mattered long before the present day, and Taylor uses this mystery to inform us that sensitivity to race and the human condition was present in the harshest of times and circumstances. With an acute eye for detail, an ear for dialog in the streets, and a true sense of the Deep South, Waights Taylor Jr. touches us with a mystery that defines the human condition." "Waights Taylor Jr. has done it again as he reconnects readers with Joe McGrath and Sam Rucker in Touch of Redemption. Taylor formed the unlikely friendship between the two in his first award-winning novel, Kiss of Salvation. Joe is white, Sam is black, and they now work together as private investigators in 1948 racist Alabama. Taylor masterfully weaves his story against the backdrop of the Deep South where there is as much to fear from the police and judiciary as from the murderers. No easy task, but Taylor’s roots are deeply embedded in Alabama and prove to be his most valuable asset in understanding the sticky and perilous nuances. As in Kiss of Salvation, Taylor beautifully weaves the threads of racism and each characters’ personal strengths, weaknesses, and challenges into a sturdy rope. I’m looking forward to the third novel that Taylor has promised to write to conclude the trilogy."